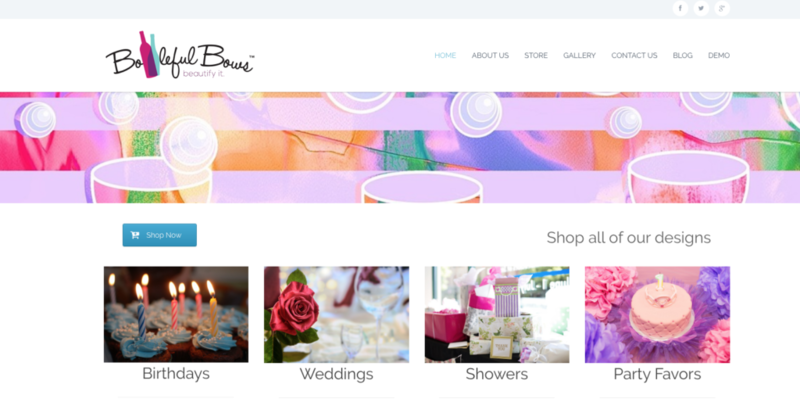 New Website built for Bottlefulbows! BE THE FIRST …..GO AHEAD…..TOP IT…..STOP IT…..BEAUTIFY IT WITH A BOTTLEFUL BOW™ !!! Place it on top of your unopened wine bottle instead of a bag or a box. Make your gift of wine stand out! Bottleful Bows™ are unique and distinctive. Place it on top of your opened bottle of wine instead of using a conventional wine stopper or reusing the cork. Next, twist the top ring clockwise. Make your gift of wine stand out by preserving it. Drink the rest tomorrow or whenever you like! Bottleful Bows™ are unique and distinctive. Blue & Pink Cupcake Wine Toppers for Birthday parties. Blue & Pink balloons for any baby shower or party. Wedding toppers include classic red rose, violin, doves or the Eiffel Tower.